Heritage Trees are trees that have been formally recognized by city council for their unique size, age, historical or horticultural significance. Trees are often nominated by volunteers but anyone can nominate them. Once accepted by council, Heritage Trees are designated with a small plaque and listed in the Heritage Tree database. There are more than 300 Heritage Trees throughout Portland, and new trees are added each year. Heritage Trees are protected by city code; once designated, no Heritage Tree can be removed without the consent of the Urban Forestry Commission and the Portland City Council. The Urban Forestry department oversees the Heritage Tree program. Thank you to Gina Dake and the department for granting permissions to use data and photos of the trees and for generally supporting my efforts with Portland Wild. I first learned about the Heritage Tree program after seeing plaques on the Giant Sequoia on Hawthorne and 55th. These beautiful trees and thousands more are one of the elements that make Portland special. The version of the tree database and photos we're using are not completely up to date, but it's the best approximation that we can manage at this time. 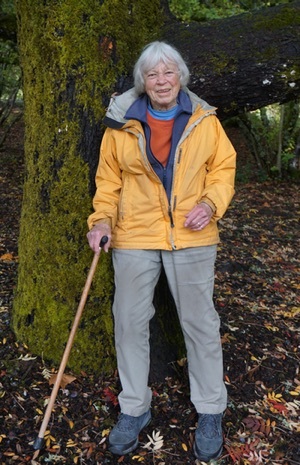 Incipient nonagenarian Dr. Phyllis Reynolds is a well-known expert on Portland's Heritage Trees. She wrote the book Trees of Greater Portland (1993, Timber Press), which was planned by her and Elizabeth Dimon. It is now out of print and has been replaced by Trees of Greater Portland: New Edition (Reynolds, 2013, Macrophyllum Press). It has 273 new photos and measurements of 137 species in the city and is available at Powell’s, Hoyt Arboretum, Audubon, and Oregon Historical Society. Many of the Heritage Tree photos on this website were taken by Dr. Reynolds. She's graciously given permission for me to use them on the site. Dr. Reynolds mentioned to me that the city regulations protecting Heritage Trees do not prevent construction teams from destroying root systems around a larger area. She said it's important that we encourage the city council to strengthen Heritage Tree protections. If you want to support trees in Portland, support the parks department and Urban Forestry but also check out Friends of Trees. 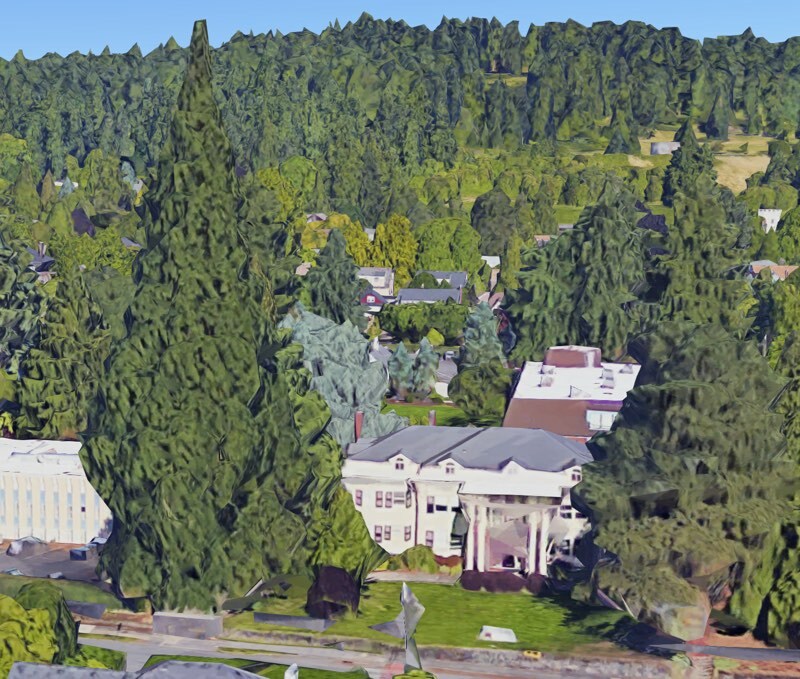 Ms. Dake pointed me to Canopy Analytics, a site that visualizes a database of all of Portland's trees via Open Street Map and Google Satellite imagery. It's created by Vivek Shandas' SUPR Lab. With Canopy Analytics, you can browse trees by height, by distance from buildings, by public or private ownership, by tree type (Evergreen or Deciduous) and highlight Heritage Trees. The site can show you the intensity of Urban Heat Islands (UHI) and links each tree to Google Satellie view. I've integrated links on Portland Wild's tree listings to Canopy Analytics. When you visit each tree's detail page, you'll see a link. There's also a link to Google's 3D satellite view which I learned from Canopy Analytics' site. Below is an image of the Giant Sequoia I mentioned above on Google 3D Satellite View with Mt. Tabor looming in the background. Here's a link to try it out yourself. Note: Google 3D satellite viewing does not appear to work on some mobile devices. Also,Matt Blair at Elsewise Media had already built PDXTrees, an iOS app, but it is now defunct. Check out his iOS app for murals, Public Art PDX which remains active. Matt has been incredibly gracious, sharing data and encouraging me to offer a map solution for the public internet, an idea he had hoped to build one day. I'm touched by his openness to supporting a "competitive" solution. Thank you Matt. If you have ideas for how to improve the Portland Wild tree collection, please visit our Feedback page. I'm interested in whether there are people interested in seeing responsible crowdsourcing on this site. I'm also interested in finding people that might wish to volunteer to improve the data and photos on the site.